Those are words I know too well. Growing up with a single mom who was a true example of hard work ethics and diligence, I learned to work hard from early on. Life taught me that “if you work hard, you get what you get ahead in life.” For that reason, I’ve never been afraid of working hard. In fact, working hard was my middle name. It wasn’t until a few years ago that I realized I had learned to work so hard that the idea of relaxing or having down time was not a part of my life. Between raising six children, traveling around the U.S. helping others through our business and fighting for my marriage and family when we were falling apart, I had stretched my work threshold to such limits that I could outwork anyone. When you had your first child you felt tired, but as your body got used to doing more, you could literally DO MORE AND MORE AND MORE. Next thing you knew, you were managing an entire household, doing taxes, cutting children’s hair, driving kids to activities, planning events and coordinating vacations. Moms: In today’s video, I want to share how you can enter a place of rest IMMEDIATELY. If you are like me, you were searching for that place of “rest,” but rest was a verb you simply could not engage in, because there were too many people depending on you. When I say I totally understand you, it is an understatement. I’ve been in your place too many times. Thankfully, I’ve learned to create pockets of boundaries to help keep me sane as I learned to find a true place of rest. In today’s video, I want to share how you can enter a place of rest IMMEDIATELY. The cool things is…there is only one thing you have to do. Only one thing. Question- From 1 to 10, how much rest do you feel you need? 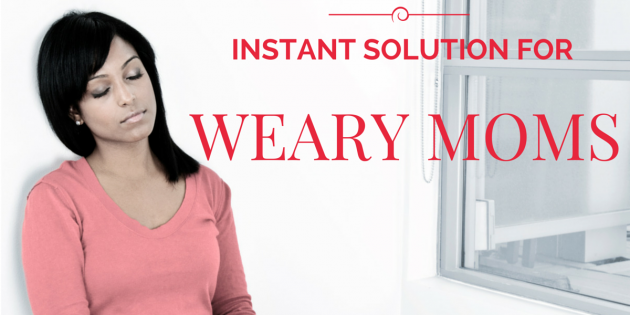 What are some of the things you feel keep you weary?